부산시립박물관에 소장되어 있는 이 불상은 정면을 향해 가슴을 펴고 당당하게 서 있는 금동보살상으로, 대좌(臺座)와 광배(光背)는 없어졌지만 비교적 잘 보존된 작품이다. 머리 위에는 상투 모양의 머리묶음(육계)이 높이 솟아 있으며, 이마에는 작은 구멍이 있어 예전에 관(冠)을 쓰고 있었던 것 같다. 이마의 머리카락은 사실적으로 표현하였으나 뒤에는 머리카락 표현이 없다. 풍만한 얼굴에는 반쯤 뜬 눈, 반달모양 눈썹, 오똑한 코가 새겨져 있으며, 잔잔한 미소가 번져 아름답고 자비로운 인상을 준다. 귀는 어깨까지 길게 내려오고 있으며, 목에는 굵은 3줄의 삼도(三道)가 있다. 신체는 탄력성있게 묘사되었으며, 풍만한 가슴에서 가는 허리로 이어지는 곡선이 아름답다. 상체는 옷자락이 양 어깨에 걸쳐 발 아래까지 늘어져 있는데 왼쪽 일부가 끊어져 없고, 하체의 옷은 U자형 주름을 좌우대칭으로 표현하였다. 양 팔 아래위로 팔찌를 하고 있을 뿐 신체에는 아무런 장식을 하지 않았다. 오른손은 옆으로 올려 손바닥을 위로 하고, 왼손은 아래로 내려 가운데 손가락을 구부리고 있는데, 손모양으로 보아 정병(淨甁)을 들고 있었던 듯하다. 당당한 신체표현에 품위와 자비를 갖추고 있는 이 불상은 통일신라 초기의 아름다운 작품이다. 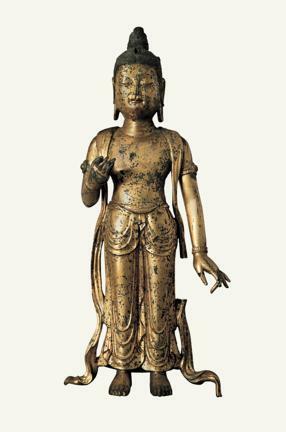 This Standing gilt-bronze Bodhisattva, preserved in the Busan Metropolitan City Museum, stands firm with its head held high. 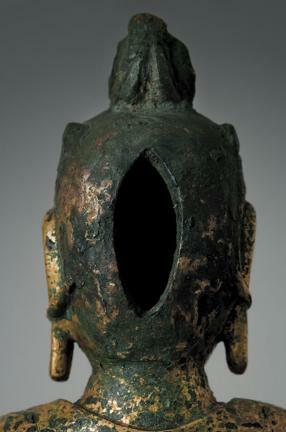 Although the pedestal and mandorla are missing, the statue had been relatively well preserved. The Bodhisattva is crowned by the usnisa, and it seems to have been wearing a crown also since there is a small hole on the usnisa. 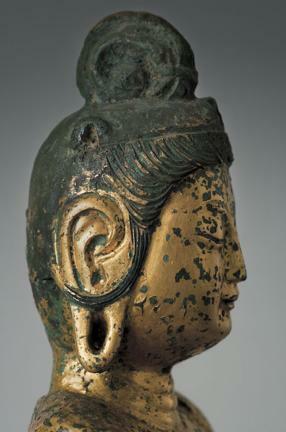 The hair covering the forehead is depicted realistically, while there are no hairs on the back. 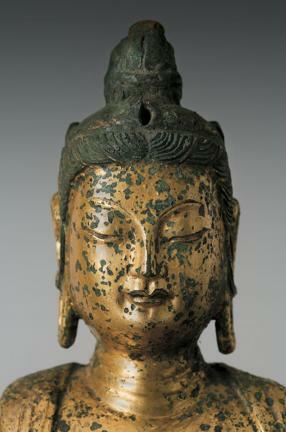 The somewhat chubby face, carved with a half closed eyes, arched eyebrows and a high nose, wears a benign smile, giving the statue a beautiful and merciful impression. The earlobes almost long enough to touch the shoulder, while the neck has bold three neck-lines. The resiliently depicted body had a beautiful line from the full bosom to the slender waist. Upper half of the body is naked, while the robe covers both of the shoulders and hangs down to the feet. The left part of the robe had been missing. The lower part of the body was depicted with symmetric U-shaped folds. 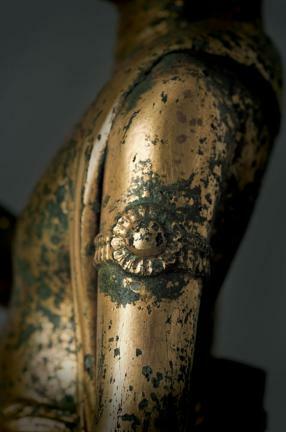 The Bodhisattva is not wearing many accessories except for the bracelets on both arms. 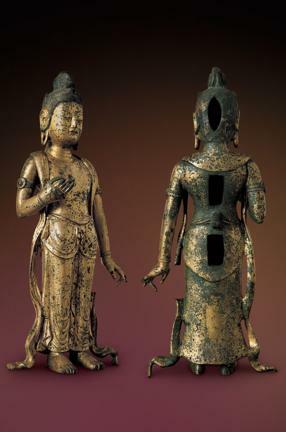 The right hand is raised with the palm up, while the left hand with its middle finger is bent, seemingly holding a Buddhist ritual sprinkler. 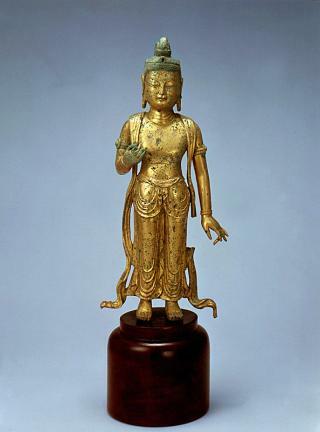 The statue, with the dignity and merciful look, is considered as one of the most magnificent artworks of the Unified Silla era.